IT organizations struggle with numerous challenges — hybrid environments, lack of visibility during cloud migration, multiple infrastructure monitoring tools, and reliance on manual processes. Yet according to a 2018 global survey, less than half of IT practitioners are confident they can ensure performance and system availability with their current toolset. As a Splunk customer, you understand the power of running your monitoring and logging environment in a machine data platform. Are you utilizing your machine data platform to effectively run APM, infrastructure monitoring and Network performance monitoring and diagnostics? 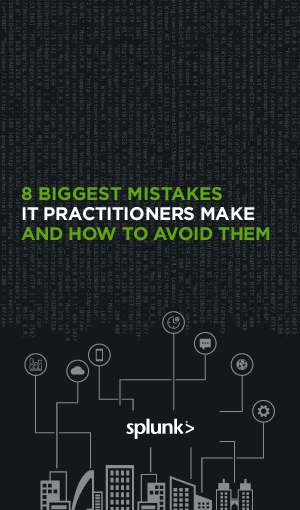 This guide outlines the 8 biggest mistakes IT practitioners make and provides solutions, key takeaways and real-world examples to help you improve IT monitoring and troubleshooting in your organization.